Today’s businesses must operate in the moment in order to maintain a competitive advantage. To do this, they need rapid time to insight, but how ready are businesses to deliver on the promise of real-time operational analytics? -Provisioning data in legacy data architectures can take weeks, or even months. -The skills required to modernize don’t exist within a traditional IT department. -Building business cases for modernization can be challenging without a fast and direct return on investment. -A lack of operational dashboarding limits insight due to the complexity of custom reporting. To combat these hurdles, you are invited to hear from two experts in the field of operational analytics. Referencing firsthand research and reports, Matt Aslett from 451 Research will discuss the current trends in operational analytics and how they relate to the emergence of hybrid operational and analytic processing (HOAP) databases. Matt will also present the four steps organizations must take in order to prepare for real-time insight, and take a peek into the future of what this means for the companies that will succeed, and for those that won’t. Sachin Smotra, Director of Product Management at Couchbase, will then explain how operational analytics can be achieved without the heavy lifting of data lakes, data warehouses, and complex ETL processes. There’s a lot of JSON in this world. But if deriving value from that data requires ETL, then odds are your technology isn’t agile enough to unlock operational insights when it matters most. Couchbase Server 6.0 introduces the new Couchbase Analytics service, enabling you to analyze data in its natural JSON format and get instant insights without having to worry about transforming and processing data. It also includes N1QL for analytics, the first commercial implementation of a query language based on the SQL++ framework. Architecting a mobile storage solution may feel like a daunting task, but it doesn’t have to be. In this webinar, we’ll guide you through the toughest challenges and demonstrate how NoSQL can deliver a seamless mobile experience anywhere by extending your data center to the edge. You’ll see how Couchbase Mobile makes it easy to ensure your local data is always available. We’ll show you how to achieve auto sync from edge to cloud and direct peer-to-peer sync for exceptional online and offline experiences. And you’ll learn how Couchbase provides enterprise-grade security with end-to-end and over-the-wire encryption. Architects and developers know that building a great-looking app is only the beginning. Liberating data quickly and at unlimited scale is what allows you to deliver a seamless application experience every time – regardless of device, location, or time. But traditional relational databases weren’t designed to meet the rapidly changing requirements of modern web, mobile, and IoT apps that have to deliver responsive digital experiences. In many situations, a data store based around NoSQL may hold the key – but there’s no one-size-fits-all solution. So what are the practical considerations when evaluating NoSQL options? 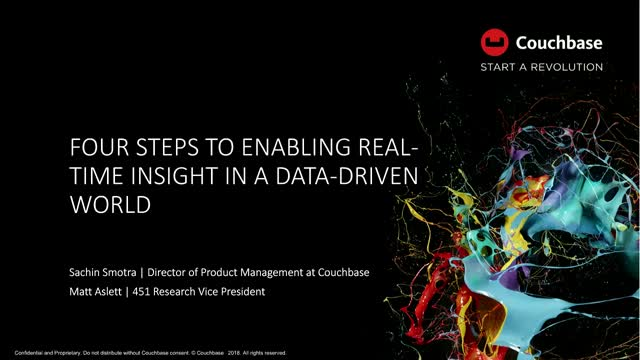 Join this live expert interview with Anil Kumar, Director of Product Management at Couchbase, for an in-depth discussion on how to successfully containerize your database. Join this live panel discussion with thought leaders at AWS re:Invent 2018 for coverage of strategic best practices for those moving to cloud/hybrid-cloud environments for their real-time applications. Also learn how containerization will be affecting the future of the technology industries in areas such as high operational costs, vendor lock-in, and reducing time to market. The unique and powerful architecture of NoSQL can provide unparalleled performance at any scale for cloud and container-based environments - even across multiple datacenters operated by different cloud vendors. In this webinar, Mike Wiederhold, Sr. Manager Engineering-Cloud, Tools & UI, will explain how you can run Couchbase NoSQL as-a-service in the cloud which includes unique Multi-Dimensional Scaling, in-memory performance, and flexible JSON document store, all of which make Couchbase ideal for modern containerized mission-critical applications. Mike will also show you how to deploy a Couchbase cluster in OpenShift with a Couchbase operator, and how to manage Couchbase’s high availability and resiliency in a distributed system while running on the Red Hat OpenShift Container Platform including a live demo where he will create a Couchbase cluster on Red Hat OpenShift Container Platform.